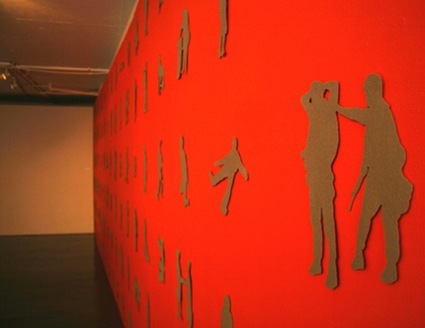 This installation shows silhouettes of people involved in routine activities alongside soldiers and people involved in criminal or illicit activities. All the figures are stuck against a bright orange wall, creating a variety of unusual optical effects. 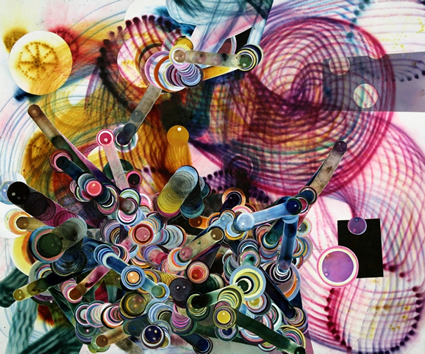 As part of a show also called Legion, this piece drew on current geopolitical anxieties and breakdowns where distinctions collapse between battlefield and homeland, combat and politics, and friend and enemy. well... I am torn between Jefferson and the golirla or Lincoln on a grizzly!!! --nah --you chose the best!! !Good grief! --what words did you use for your google search!!!? What is most interesting to me about Mr. Roosevelt's work is that, by using a single color to create his art, he strips away the social constructs that are assigned to someone because of their gender, race, and socio-economic status. He strips it down to the essential connection - humanity - and takes off all other barriers or elements that may keep someone from study the action or emotion of the scene. As a social science type, I am constantly confronting art that purports to engage with les politiques, and consistently vomiting, just a little, into the back of my mouth. On the contrary, Ben Roosevelt's icons conjure our social setting and its semiotics adroitly, imaginably, but also, respectfully. Nonetheless, the work itself is artful enough to escape positivism, empiricism, or other such false naturalisms. Roosevelt's work succumbs neither to preoccupations with style nor to delusions of neutrality. Ben's work allows for all of us to engage each other as we are meant to do - expressing our views and interpretations in our own ways. His work does, has always, and will continue to stimulate each of us in a very personal, yet sometimes conflicting way. That's life, and at its best, art represents life as the artist sees it. Keep representing, man, no matter what anyone else says. It's your view of life...live it to the fullest. @David....lmao at your comment, "I mean, you paint big bugs..." Damn funny. I'm no professional(or amateur)art creator or critic, but I really like this. It wants inquiry and pattern/story making. As a viewer, I want be right there to engage with it. Keep doing what you're doing, Mr. Roosevelt. Give this guy more tax dollars! 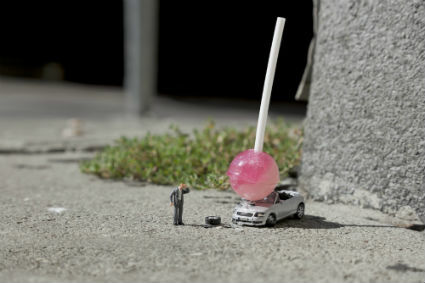 Although conceptual in nature, I feel that this work should be accessible and engaging to most of the general public. Anyone, including children, will have a reaction and can generate an interpretation of the figures. Put in the context of the field of figures, the play of associations with the icons can work on levels from basic intuition to intellectual analysis. Mr. Roosevelt's playful visual commentary on our relationship to common spaces and the customary use of them provokes a certain feeling of thoughtfulness in the otherwise mundane. Thanks for sharing this work.